News and thoughts about mental health, psychiatry, and research. In 1994, Dr Phillip Long founded www.mentalhealth.com aiming to create a cross-cultural encyclopaedia of mental health conditions. 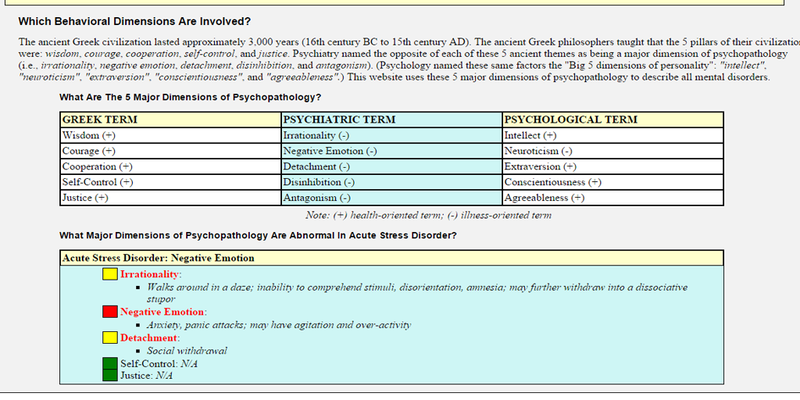 The site is looking a little archaic now, using older DSM categories not commonly used now, and containing diagnostic ideas that didn’t really catch on, such as analysing all mental health symptoms through Greek personality dimensions. While the site may not be entirely relevant these days, it’s a fascinating and detailed read. Moreover, it’s attached forum has been consistently running since 2005. In internet terms, this is an incredibly long time. Imagining friendships possibly extending for 10 years, its easy to see the best part of forums; their ability to connect people with others across time and space, providing friendships built on common experience and support. Of all the major social networks, Tumblr is the one I wanted to write about the most, because its a dramatic difference from the stoicism of Twitter and the envy-inducing highlight reel of Facebook. Just like most of its users, its young, bold, and easily misunderstood. For the uninitiated, Tumblr is a microblogging site with a very “anything goes” attitude towards content: drawings, videos, music, gifs, longform text, links and pretty much anything else you can think of are all found there. Its major feature is reblogging, which is reposting someone else’s content onto your own feed and adding commentary, opinions, or a visual response- a cross between a Twitter retweet and a standard blog’s comment chain. Content is organised and collected using hashtags, which are essential for posts being discovered and read. Everyone, their mum, and their cat has Facebook, or so it can often seem. As one of the most subscribed-to places online, and perhaps some people’s only online connection, looking at what Facebook has to do with mental health could be important on a large scale. Simply searching for “Facebook” flags up a New Yorker headline- “How Facebook Makes Us Unhappy”. Narrowing it down to “facebook and mental health” adds BrainBlogger’s “Facebook is no friend to mental health”, and “7 Ways Facebook is Bad For Your Mental Health, from Psychology Today. The BrainBlogger and Psychology Today articles were almost uniformly negative, showing research that connects Facebook use to envious friendships, jealous relationships and decreased life satisfaction. The New Yorker article included its fair share research on the unhappy consequences of Facebook usage, but also included some optimistic findings . Their best answer was; it depends what people are actually doing on Facebook. People actively using Facebook to keep in contact and engage with loved ones benefit from the social connection. People passively browsing their timelines, however, are often left feeling worse after using Facebook. If actively participating on Facebook is generally beneficial, does that make Facebook a good resource for people with mental health issues?